Toddington Manor Head gardener, garden designer for 'Applegate Gardens' and 'Garden Design Pro'...: What soil do I have? Every garden soil is different. All are mixtures of sand, clay and silt, but in differing quantities. 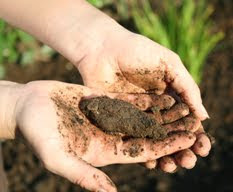 To determine what your soil is, take a piece of soil about the size of a golf ball and roll between your fingers removing any large stones. Now try to roll into a ‘worm’ shape. A sandy soil will not form this shape, it simply falls apart. If you can form this shape easily and when rubbed, the surface turns shiny, this is clay soil. However, if the ‘worm’ can be crushed in the palm of your hand, then you have a loam soil, perhaps the most desirable of soil types. 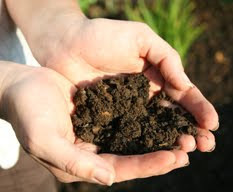 Very similar is a silty soil, which possesses a silky feel. 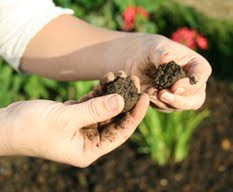 You can improve every soil by adding organic material such as compost or manure. This helps bind particles together in a sandy soil, or helps clay soil become more workable. Knowing your soil will help you choose the right plants for your garden and enjoy more success growing healthy and happy plants.